As you probably already know, Pokémon Go is an augmented reality game that makes use of real-world locations. Most locales are flagged as simple Pokestops, where players can collect resources, but some landmarks, which the game calls gyms, are more special than that. At gyms, players can take control of a venue much like they can in Foursquare, except the only way to maintain leadership here is through battles. The most powerful trainers can install their Pokémon team to defend the gym in question, and their chosen monsters will stay at that locale until they are defeated. Challengers can drop by the gym at any time to fight gym leaders, and if new contender is victorious, not only will they gain XP, they also have a chance to claim the throne. Since Pokémon Go also allows players to join a team, gyms end up being hotbeds for competition and dominance. The joke at the time was that it must have been Barack Obama’s Blastoise, though it’s unclear who actually owned the very first Pokémon at the White House. Once it became known that the White House could be a playground for Pokémon Go, Washington D.C. players started flocking to the government building, hoping to lay claim to it. 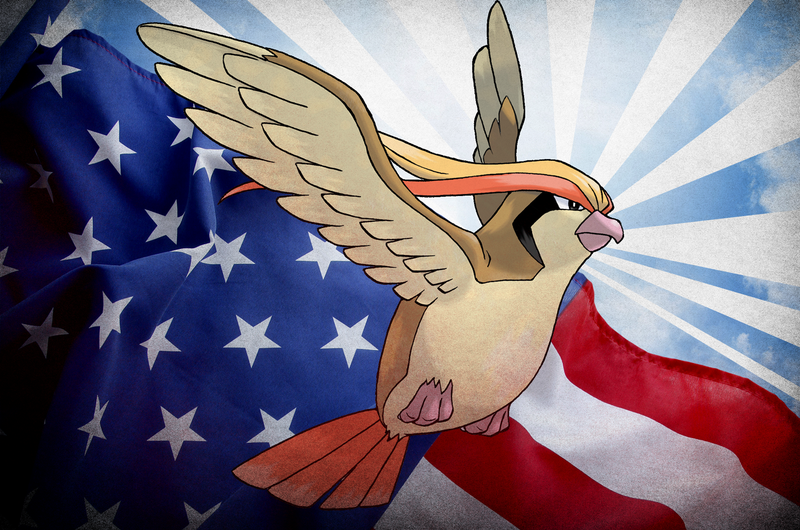 The next viral image to arise from the White House was of a cleverly-named Pidgeot named MERICA. As you can see, Pidgeot is a Pokémon that looks a hell of a lot like a bald eagle, which makes it a perfect match for the White House. That Pidgeot belongs to 28 year old Jesus Rodriguez, a man who makes a living by making chemo medication for a pharmacy. Rodriguez saw the Blastoise at the White House last week, and he immediately took it as a challenge. “I download the app as soon as it was available on the app store and got to work,” Rodriguez said. The first issue that Rodriguez came across wasn’t the rigors of training, or the strength of his opponents: rather, it was the spottiness of the Pokémon Go servers, which made it difficult to connect to the game at all. “The only way to really get anything done was at night,” Rodriguez said. This makes sense, because odd hours are less likely to clog Go servers with traffic. Unfortunately, connectivity issues weren’t the only obstacle for Rodriguez’ fight for the White House: initially, a nasty glitch also got in the way. “My first attempt was a failure,” Rodriguez said. “It wasn’t because I wasn’t strong enough, but because the 1 HP glitch (that is when you can’t finish off a Pokemon in battle due to server issues).” Judging from reports online, the 1HP glitch is plaguing a lot of other players, too. At this point Rodriguez noticed that popular Pokémon Go memes involved the naming of the creatures themselves, so he regrouped and decided to take the White House with something a bit more patriotic. That’s how MERICA the Pidgeot was born. Rodriguez’ dominance did not go uncontested, however. MERICA was just the start of a larger, more heated war to claim the White House. Players are coming together across various team-specific subreddits to discuss strategy, as well as other goofs they can plant in the White House (one mentioned by Rodriguez is to put a monster named Corey there, after the Disney show Corey In The House.) One of the silliest tactics that has arisen thanks to this clash is approaching the White House area in the middle of the night. At this point, the war is sprawling out to the rest of the D.C. area, where other government buildings have also started to catch the eye of ambitious Pokémon trainers. Additional reporting by Kevin Draper.